Subject: One day training programme for dealing Assistants/ Section Officers/Under Secretaries dealing with Pension related matters and working on ‘Bhavishya’ Module. The undersigned is directed to refer to this Department’s O.M of even number dated he 16th June,2017 on the above mentioned subject and to say that the nominations of the officers/officials, as per the attached list, have been accepted for the training programme on Pension related matters scheduled to be held from 10.00 AM to 5.00 PM on 24th August, 2017. Further, it is also stated that due to some administrative reasons the venue of the training programme has been changed from Vigyan Bhawan to India International Centre, Seminar Room - I & II, Max Mueller Marg, Lodi Road), New Delhi-110003. It is also reiterated that only repeat only those officers/officials whose names/nominations have been accepted (as per attached list of 105 participants ) by this Department ,should be relieved to attend the Training Programme. 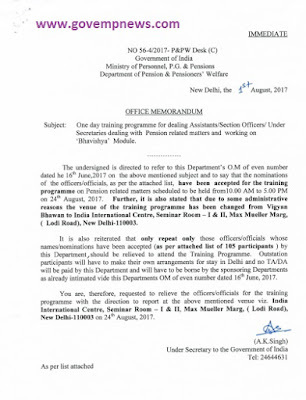 Outstation participants will have to make their own arrangements for stay in Delhi and no TA/DA will be paid by this Department and will have to be borne by the sponsoring Departments as already intimated vide this Departments OM of even number dated 16th June, 2017. You are, therefore, requested to relieve the officers/officials for the training programme with the direction to report at the above mentioned venue viz. India International Centre, Seminar Room - I & II, Max Mueller Marg, ( Lodi Road), New Delhi-110003 on 24th August, 2017.